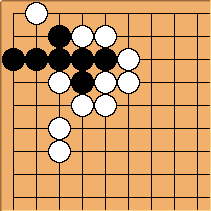 Perhaps tsumego problems can be re-arranged into standard forms. 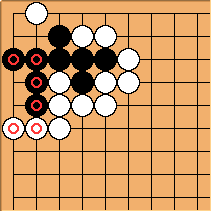 For example, in the following problem black has 2 areas in which to make eyes. Clearly on the side black has a half eye. The key to the problem is to make one and a half eyes in the corner. The marked stones being the standard form of a half eye on the side. Jan: I can imagine problems where this normal form would give away part of the solution... Maybe it's better to think of a more lexicographical scheme: move the problem to a fixed corner (lower left, for instance) and then choose between the two mirrorings in the X=Y -axis by letting the "bulk" (shape of occupied points) of the problem lie below that axis. If the bulk is symmetrical, repeat for the "bulk" of the black stones. If that bulk is symmetrical as well, the entire problem is symmetric. Charles Matthews I think there is something to the idea, though it is far too limiting in general. I have seen about 50 examples of problems 'to make one eye', that is, to recognise half an eye; and I think there are also problems to recognise one eye, and an-eye-and-a-half, as here. But there are also problems where you have to show that two parts of the eye formation aren't tactically disjoint.